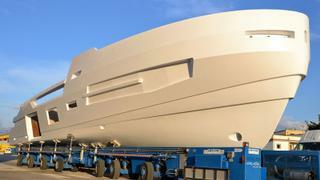 Construction on first Arcadia Sherpa XL "perfectly on schedule"
The first Sherpa XL is proceeding "perfectly on schedule"
Italian yacht builder Arcadia Yachts has revealed that the construction of its first ever Sherpa XL is proceeding "perfectly on schedule". 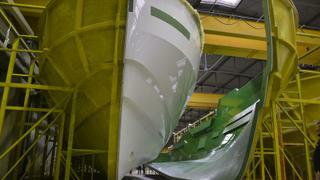 The yard revealed it has completed all carpentry work on the 23.8 metre pocket superyacht and is finishing the process to connect the hull and deck. The hydraulic and mechanic systems are also simultaneously being installed. 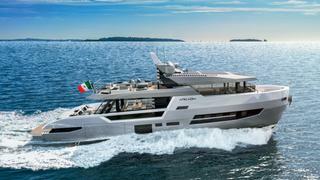 Designed inside and out by Milan design studio Hot Lab, the yacht is currently being built on-spec. It is set to make its debut at the Cannes Yachting Festival later this year. The Sherpa range was first introduced with the original 16.8 metre Arcadia Sherpa shadow at Boot Düsseldorf in 2016. The new Sherpa XL builds on the success of this, presenting a more self-sufficient "pocket superyacht" with larger deck areas and spacious interior volume thanks to its roomy 6.9 metre beam. The yacht boasts 220 square metres of interior and exterior living space. The eco-friendly Sherpa XL yacht is equipped with Arcadia's trademark solar panels, which provide up to 2kW of clean electricity. This is sufficient to power nearly all the yacht's hotel load, except for the air conditioning. The yacht will also be fitted with low-consumption appliances and LED lights to further reduce its environmental impact. The cockpit features narrow bulwarks to provide guests full views, and there is no tender launching or technical equipment to spoil the view as the tender is kept forward of the engine room and launched through a side hatch. There is a sizable skylounge on the upper deck served by a bar and pantry facilities. Windows roll down here to fully connect guests with the outdoors. The contemporary interior by Hot Lab can be had in a three- or four-cabin layout. In the former, the galley is set in the skylounge, while in the three-cabin the galley is on the lower deck. The Sherpa XL is powered by twin Volvo Penta IPS 1,050 main engines, predicted to reach a top speed of about 22 knots with a long-range speed of 10 to 12 knots achieving a 1,500 nautical mile range at 10 knots. This makes the yacht autonomous, even for its smaller size. 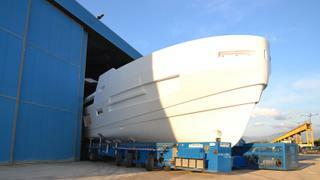 The semi-displacement hull has been designed to be 30 to 35 per cent more efficient than other yachts in its class.